I just completed my last training run before the MDS. It is not crazily hot here today, but it is pleasntly warm and sunny and I wore 2 tops to make myself sweat a bit more. The weather forecast says it is 21C (69.8F). For the next 2 weeks in fact it is showing temperatures of below 30C (86F), but we will see. As planned I ran 5km in the sand dunes. The pace was very comfortable and it took me 37 minutes and 11 seconds. 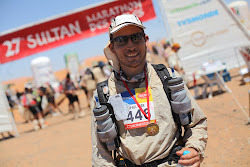 If you recall when I first arrived in Merzouga on the 23rd March I only managed 4.9km in 45 minutes, and I found that much tougher. So basically 8 minutes of improvement and at a lower perceived effort. One of the reasons for that is of course acclimatisation, but I believe knowing how to run on the sand and how to pick a good route also play a big part. What I have learnt about running in the dunes is that it is best to stay more forward on your feet and to take short quick steps rather than long bounding ones. It is also best to tread as lightly as possible, as often the top layer of sand is like a crust, and provided you tread lightly it may support your weight. This is especially important going up steep slopes where if the crust breaks you end up slipping back at least half of the distance you progressed forward. In terms of picking a route, virgin sand seems to be a better choice on the flat and downhills rather than following someone else's footsteps. On the uphills it depends. If you can avoid breaking the crust then virgin sand is a good choice, but if you break the crust or you know that you will then it can help to follow someone else's footsteps, as they provide a bit more traction/grip. Also the less up and down you can do the better so you need to try to choose a route that is as flat as possible (even if it is not the most direct route). Running up the dunes is very tiring and to be avoided if at all possible. Running down the dunes can also jarr your legs significantly and you risk hyperextending your knee if you are not careful. In addition it is the time when you are most likely to get sand in your shoes, as sometimes running downhill your leg slips into the sand so deeply that some sand gets in through the top of the gaiters if they are not done up tightly enough. Now that I have got my last run out of the way I am going to go and finalise my packing. I will see if I can shave some more grams off the total pack weight by getting rid of more packaging and so on. I already did this several times but I will do it again from a fresh perspective. The 180ml tube of suncream I have been using the last few weeks will also be sufficient to last me through the MDS, so I do not need to pack a new tube in my running pack as I had originally planned (another 80g or so saved). 100ml should be plenty sufficient as only my face, hands and a small section of my legs between the bottom of my shorts and the top of the gaiters is exposed. I will also have to shave my toes as part of my final preparations. I found the places on my feet where friction blisters are most likely to occur these last 2 weeks (through having had them), and it seems the tops and the underneaths of my toes are vulnerable. For this reason I will tape them up before the first day, and it makes it much easier to remove the old tape and apply fresh tape when the toes don't have any little hairs on them. I ordered my shoes 1 size larger than normal, and till now I have not experienced any foot swelling, so the blisters were caused by my feet moving around in the shoes. Hopefully having run in the oversized shoes for 2 weeks now though, my feet will be used to them and have toughened up significantly. That's all for now folks. One more post to go (after the sauna tonight) and then I wil just leave up a post with the details of how to write to me during the race and how to follow my progress. You wont hear from me then until I have finished.